Visual Astronomy: Bears in Space? Bears in Space? Is this guy crazy? (Well, maybe) but for the most part, no! A recent experiment on board the ESA's FOTON-M3 spacecraft showed that a small creature known as a "water bear", similar to a sea monkey, can survive in the cold, hard vacuum of space! The water bear is a tiny six-legged creature, seen at right, and is also commonly known as a "tardigrade". These water bears work similarly to a sea monkey. When they are presented with extreme habitats (like space), they go into a death-like standby mode. Then when the conditions are right, they resume normal metabolism, literally coming right back to life. The most interesting part of this is the fact that the water bears survived the radiation that is so strong in space. Even if the hard vacuum and near zero Kelvin temperatures didn't kill a living organism, the very strong radiation in space would kill almost instantly. Surprisingly enough, the water bears not only survived their trip through space, but were also still able to reproduce upon "thawing" from their 10-day adventure. Of course, this has implications beyond the terrestrial biological news, too. 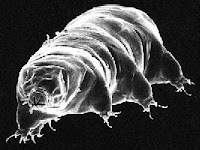 This means that these little water bears could potentially survive a short trip through space. If it's possible for certain terrestrial creatures to survive in space, what does this mean for our perception of "life" in general? Is there perhaps microbial life that survives in harsh conditions on other worlds? This is also huge news for the proponents of the "panspermia" theory of terrestrial biology. Panspermia basically theorizes that life did not evolve here on Earth, but rather elsewhere. Such life could then arrive as microbes on a meteoroid, and evolve from there. Microbes arriving on a meteoroid landing in water would have a higher chance of surviving the heat and impact. It is also very possible that such an organism could leave Earth on our spacecraft (accidentally or purposely) and "thaw" somewhere else (a sort of reverse panspermia). Could such a life form have existed before life here on Earth? Share your thoughts on these theories in comments below, if you'd like! I'm still at a loss as to how the fact that a microbial animal can survive in space automatically means that it could survive a "trip through space". It was observed in space with a human's help. It could not get out of the earth's atmosphere without a human's help (and space ship). It could no re-enter the earth's atmosphere without the human's help. I do find it amazing that a life form could function in the harsh conditions of space but I can't see how this is evidence for life elsewhere without some very generous extrapolation. That is definitely a valid point. While we may not be able to directly assume a "trip through space" we can make a good guess, as these water bears were left in space for 10 days. Now this is nothing compared to how long they would be out there for a trip! The only way I could see any organism leaving an atmosphere without a spaceship would be a large meteor impact. Lets hope that doesn't happen to us! But it certainly is an interesting thought! That it was great as well as enlightening. When the first visitor to your site to the site we’re pretty happy. I uncovered loads of enlightening information in the posting. At this moment mouse clicks Cash Advance With thanks to get writing. Have fun. Have got a fine timing.